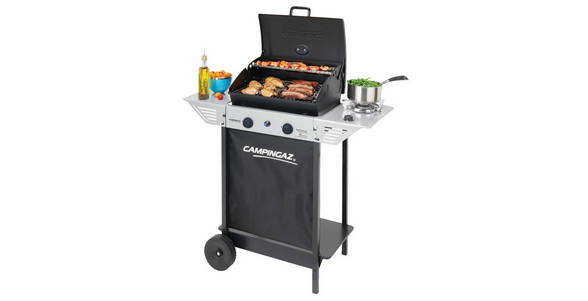 This stylish and practical barbecue is a great value option for novice grilling enthusiasts. Backed by all of our burner expertise, the Xpert 100 LS Plus Rocky incorporates a number of practical features including an additional side burner ideal for preparing sauces or side dishes. Two durable steel burners offer reliable and consistent heat which can be easily adjusted for perfectly cooked food every time. The barbecue’s large cooking surface provides plenty of room to cook for all the family and the Xpert 100 LS Plus Rocky is compatible with Campingaz Lava Rocks. As well as helping to distribute heat evenly across the barbecue, Lava Rocks help to protect the burners from dripping fat. Lighting the burners is easy thanks to the Xpert’s handy Piezo ignition. An integrated thermometer makes it easy to keep an eye on the temperature and the barbecue also features a rotisserie function for greater cooking versatility.